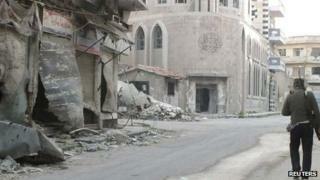 Syrian rebels are locked in a fierce battle with government troops for parts of the central city of Homs. For a third day, rebel forces tried to regain control of the Baba Amr neighbourhood; pro-regime troops responded with artillery attacks. There have also been clashes on the key road between Damascus and the airport, as well as in the city of Aleppo. Meanwhile, the UK has said it may bypass an EU arms embargo to Syria in order to supply weapons to the rebels. British Prime Minister David Cameron told a parliamentary committee he hoped to "persuade our European partners" to relax the embargo, which is due to be renewed in May, "but if we can't, then it's not out of the question we might have to do things in our own way". Earlier, Israeli President Shimon Peres called on the Arab League to send peacekeepers into Syria, saying "the United Nations should support the Arab League to build an Arab force in blue helmets". "The intervention of Western forces would be perceived as a foreign interference," he told the European Parliament, in the first address there by an Israeli head of state in almost three decades. "The Arab League can and should form a provisional government in Syria to stop the massacre, to prevent Syria from falling to pieces." Meanwhile, the UN children's agency Unicef has warned of a lost generation of children in Syria, in a report to mark the second anniversary of the start of the conflict. It said the two million children aged under 18 remaining in Syria were growing up knowing nothing but violence, were being deprived of a right to an education and were suffering traumas that could scar them for life. Rebel soldiers launched a surprise attack in Homs on Sunday morning, in an attempt to retake the Baba Amr district which was overrun by pro-Assad forces a year ago. "The rebels infiltrated Baba Amr during the night," the Syrian Observatory for Human Rights (SOHR), a UK-based activists group, told the AFP news agency at the time. "Those manning the army checkpoints barely had time to realise what was going on," said director Rami Abdel Rahman. The regime has responded with air strikes and shelling, sent in reinforcements and sealed off the city, according to the SOHR. "The army will at all costs hunt down the rebels even if it destroys the neighbourhood," Mr Abdel Rahman said. "The regime cannot allow them to stay... because the neighbourhood of Baba Amr is known as an (anti-regime) symbol in the international media." The SOHR is one of the most prominent organisations documenting and reporting incidents and casualties in the Syrian conflict. The group says its reports are impartial, though its information cannot be independently verified." The Geneva-based World Food Programme said the renewed violence had forced at least 3,000 families to leave Baba Amr. Meanwhile, there has been fighting on the eastern side of the capital Damascus, as rebels try to seize the strategically important road leading to the airport. An unnamed opposition rebel commander, quoted by Reuters news agency, accused pro-Assad forces of killing at least 30 army deserters in an ambush on the road as they were being guided into a rebel-held district nearby. The report has not been verified. Fresh clashes are also being reported around the airport in the northern city of Aleppo, as rebels intensify their assault on nearby air bases. As many as 70,000 people have died in the two-year conflict, the UN believes. More than a million Syrians have now been registered as refugees by the UN in neighbouring countries.